The persistence of child malnutrition in low-income countries appears to be due to multiple of factors that include uncertain access to enough food and inappropriate dietary practices. , Previous studies have suggested that the lower prevalence of undernutrition in urban area relative to rural area is due to a series of more favorable socioeconomic condition which, in turn, translate to provision of adequate and appropriate diet and better caring practices for children. However, data establishing differences in dietary practices among under-five children in rural and urban communities in Nigeria are lacking. This study was carried out to compare dietary practices and nutritional status of children in rural and urban communities in Lagos State, Nigeria. The study was carried out in the Epe Local Government Area (LGA) and the Alimosho LGA in Lagos State, Nigeria, which were randomly selected from the twenty local governments in Lagos State officially recognized by the Federal Government of Nigeria. Lagos State is Nigeria's former capital city. The vegetation is that of the tropical rain forest. It has an annual rainfall of 180 cm and a mean temperature of 26°C. It is 200-500 m above sea level. Lagos has a very diverse and fast-growing population, resulting from heavy and ongoing migration to the city from all parts of Nigeria as well as neighboring countries. Although the Yoruba, an African people inhabiting Southwest Nigeria, constitute the city's principal ethnic group, there are a significant proportion of other ethnic groups, particularly the Ibos, Ibibio, and Hausa. The study was a comparative-analytical study of children aged 0-59 months in rural and urban communities located in randomly selected LGAs of Lagos State, Nigeria. Ethical clearance was obtained from the Lagos State University Teaching Hospital Research/Ethics Committee. The approval was also obtained from the local government authorities and the parents who were involved. A multistage sampling technique was used to select study participants. The first stage involved random selection of Epe LGA and Alimosho LGA from the twenty LGAs in Lagos State. In the second stage, Epe and Agbowa were randomly selected from the Epe LGA, representing urban and rural communities, respectively, while Akowonjo and Orisunbare were selected from the Alimosho LGA, representing urban and rural communities, respectively. In the third stage, houses were selected randomly from each community using the table of random numbers. Finally, in each household, the parents of children aged 0-59 months were identified, and informed consent was obtained before collection of data. The sample size: This study was part of a larger study on relationship between maternal and child nutritional status in rural and urban communities in Lagos State, Nigeria. "z" is the critical value and in a two-tailed test it is equal to 1.96. "d" is the absolute sampling error that can be tolerated. In this study, it was fixed at 5%. = 125.9 which is approximately 126. Taking into consideration a possible attrition rate of 10%, the minimum sample size for this study will be 137. This was rounded up to 150 each for rural and urban communities. Complete data were collected from 300 participants comprising 150 each for rural and urban communities. Information was obtained on sociodemographic, characteristics, breastfeeding practices, and type of solid, semisolid or soft foods taken by children. The families were assigned a socioeconomic class using the method recommended by Ogunlesi et al. The parents' occupations and highest education attained were scored from 1 (highest) to 5 (lowest). The mean score for both parents gave the social class, falling within the 1-5 range. Those with mean scores of 1 and 2 were further classified as upper class, those with mean score of 3 were classified as middle class, while those with mean scores of 4 and 5 were classified as falling in the lower social class. A documentation of all dietary intakes including in-between meals was done using a conventional 24-h recall method which depends on correct recall of the type of foods consumed. The children were weighed with light clothing using an electronic weighing scale calibrated in 100 g units (SECA/UNICEF, Australia). Children who were too scared to stand on the scale were weighed together with the mother, and the mother's weight automatically deducted to obtain the weight of the child. All children were weighed naked and to the nearest 0.1 kg. Length of children aged <24 months was measured using an infantometer. This was done on a firm surface with assistance, usually by the mother. The knees were held down and the head held firmly against the headboard. These measurements were done to the nearest 0.1 cm. Height was measured using a height board for children aged 24-59 months. This was done with the children standing erect without shoes, with eyes facing forward and the feet together on the horizontal plane. Standardization checks on the tools for anthropometric measurements were done periodically. Malnutrition in children was calculated from the degree of stunting (height-for-age), underweight (weight-for-age), and wasting (weight-for-height) following WHO guidelines and cutoff points. In this study, a child was said to be underweight, wasted, and stunted if the weight-for-age, weight-for-height, and height-for-age were <−2 standard deviation (SD) from the median of each international reference standard, respectively. The WHO Anthro 2007 was used to generate Z-score values for weight-for-age, height-for-age, and weight-for-height. All data were entered into and analyzed using Statistical Package for Social Sciences (SPSS) software version 22 for Windows (IBM Corporation, Armonk, NY, USA). The means and SD were calculated for continuous variables while ratios and proportions were calculated for categorical variables. Independent t-test was used to calculate mean differences for continuous variables between urban and rural communities. Categorical variables were compared using the Pearson Chi-square (χ ) test. P < 0.05 was considered statistically significant. A total of 300 children were studied, consisting of 150 each from rural and urban communities, and the results obtained were analyzed. [Table 1] shows the sociodemographic characteristics of the study population according to their place of residence. The mean age of children in rural community was significantly higher than those from the urban community (31.3 ± 16.4 months vs. 19.3 ± 16.4 months; P < 0.001). Gender distributions of the children were not statistically different with male:female ratio of 1:1.3 in rural areas and 1:1 in urban areas. About half of the children (52.7%) in urban areas were of the first birth order compared with 39 (26%) children in rural areas. This difference was statistically significant (P < 0.001). The educational level of both fathers and mothers was significantly better in urban than rural areas (P < 0.001). A statistically significant proportion of the children in the rural areas were from lower social class compared with children from urban areas (90% vs. 64%, P < 0.001). Two hundred and ninety-eight children (99.3%) in this study were breastfed [Table 2]. One child each from urban and rural communities was not breastfed. The reason for not been breastfed at all was not given. There was no significant difference in time of initiation of breastfeeding between children from rural and urban areas (P > 0.05). Forty-three (28.7%) children from rural area and 38 (25.3%) children from urban area were exclusively breastfed for 6 months. There was no significant difference (P > 0.05). 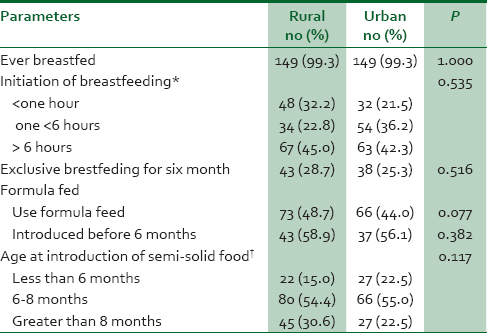 However, the mean of total duration of breastfeeding was significantly higher in rural area than urban area (16.0 ± 4.6 months vs. 14.1 ± 4.2 months, P = 0.003). Overall, 139 (46.3%) children were given formula feeds with no statistically significant difference between rural and urban children. More than one-half of the children in rural (58.9%) and urban area (56.1%) who received formula feed were introduced to it before the age of 6 months. The mean age of children at introduction of semi-solid food in rural area was 8.51 ± 7.3 months while in urban it was 7.54 ± 4.0 months and this was not statistically significant (t = 1.3, P = 0.196). 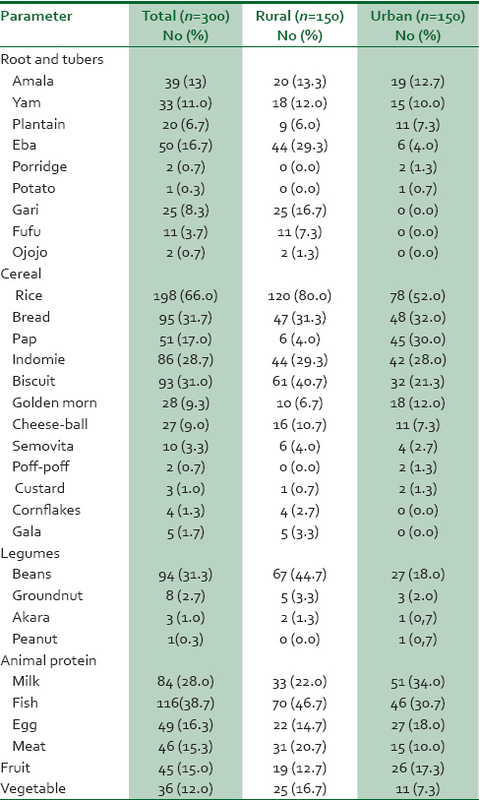 [Table 3] shows that children from rural and urban communities consumed more cereals, legumes, and animal proteins than any other food group. For the cereal group, most popular food item consumed was rice, bread, spaghetti, and biscuit in both rural and urban communities. In urban community, there was also a high frequency of consumption of pap relative to rural community (45% vs. 6%) while in rural community there was a high frequency of consumption of eba compared to urban community (44% vs. 6%). Among the plant and animal protein, the food items commonly consumed were beans, milk, and fish. The consumption of beans and fish was higher in rural community while consumption of milk was higher in urban community. The consumption of roots and tubers, fruits, and vegetable was generally low in both rural and urban communities. The mean weight and height were significantly higher among children from rural than urban areas [Table 4]. Both weight and height increase with age in both sexes in children from rural and urban areas. However, the degree of association of weight and height with age were higher in urban children (r = 0.894 and 0.946, respectively) than rural children (r = 0.736 and 0.857, respectively). When weight and height of children were compared age-for-age with a reference standard, the mean weight-for-age Z-score and height-for-age Z-score were significantly lower for the rural children compared to those from urban area. 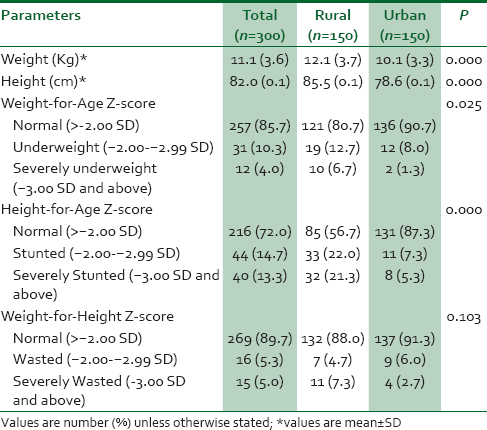 The prevalence levels of underweight and stunting were significantly higher in rural area than urban areas (19.4% vs. 9.3%, P = 0.025 and 43.3% vs. 12.6%, P < 0.001, respectively). This study highlights differences in the feeding practices of under-five children in rural and urban communities in Lagos State, Nigeria. Even though almost all the mothers breastfed their children, the prevalence of exclusive breastfeeding for 6 months was very low in both rural and urban communities. However, the figures were higher than the national prevalence of 17%. The lower prevalence of exclusive breastfeeding in urban area when compared with rural area may be due to career women or women in civil service jobs who have to resume for work after 3 months maternity leave. This could also explain the high rate of use of the formula feeds in urban areas. The higher rate of use of the formula feeds in rural areas could be due to lack of awareness about value of breastfeeding as noted some years ago  or demonstration of sophistication and false affluence by mothers. It is important to note that the prevalence of exclusive breastfeeding continues to decline in Nigeria and urgent steps need to be taken by government to correct this trend. Recently, the Lagos State Government of Nigeria increased the duration of maternity leave for civil servants from 3 to 6 months and also introduced 10-working days paternity leave for male employees who may want to join their wives to achieve good parenting. The effect of this on rate of exclusive breastfeeding and nutritional status of children will need to be determined. Children are expected to be introduced to solid, semisolid, or soft foods at the age of 6 months and above to complement breastfeeding. In this study, more than half of the children both in rural and urban areas who were already commenced on semisolid feed had it introduced between age of 6 and 8 months. This was similar to 58.2% observed among infants in Kano,  Nigeria, higher than 40% in rural central Tanzania,  and lower than 65.5% among infants in rural Shaanxi province in China. The implication is that the remaining children are likely to be at risk of malnutrition. The high frequency of intake of cereals and low intake of proteins, fruits, and vegetable is common to both rural and urban children in this study. A similar study from a rural South African community reveals a high intake of carbohydrate-rich foods, and irregular intakes of foods of animal origin, fruit, and vegetables. Recently, in Europe, there is public health concern about suboptimal micronutrient intakes. Reduced intake of fruits and vegetables in children could lead to low micronutrient intake. The micronutrients such as Vitamin A help improve the immune system and thereby prevent infections which could tilt children to severe protein calorie malnutrition. The limitations of this study include involvement of only two LGAs of Lagos State. However, the findings can be generalized to the broader community. We recommend that further cross-sectional research work involving other communities and a larger sample frame is needed to better understand rural-urban differences in dietary practices among under-five children. Information on dietary practices was based on self-report and this may lead to underestimation or overestimation resulting from mothers' incorrect recall. This study has shown that there are no significant differences in rate of exclusive breastfeeding, use of formula feeds, and time of introduction of semisolid feeds among under-five children in rural and urban communities in Lagos, Nigeria. The diversity of solid, semisolid, or soft foods given to children and frequency of consumption are similar in rural and urban communities. However, the prevalence of undernutrition is higher in rural community. This implies that efforts at achieving effective control of undernutrition must be concentrated in rural areas with a focus on interventional measures that addresses socioeconomic gaps between rural and urban communities. There is also need for aggressive promotion of breastfeeding, appropriate time of introduction of semisolid food, and discouraging use of formula feeds. Mothers should be encouraged that diversity should be included in the choice of foods for their children, especially from animal protein, fruits, and vegetable groups in both rural and urban communities. World Health Organization. Children: Reducing Mortality. Available from: http://www.who.int/mediacentre/factsheets/fs178/en/. [Last accessed on 2015 Jun 21]. United Nations Children′s Fund: Improving Child Nutrition: The Achievable Imperative for Global Progress. Available from: http://www.unicef.org/publications/index_68661.html. [Last accessed on 2015 Jul 13]. Martorell R, Zongrone A. Intergenerational influences on child growth and undernutrition. Paediatr Perinat Epidemiol 2012;26 Suppl 1:302-14. World Health Organization. Malnutrition: The global picture. In: Nutrition for Health and Development: A Global Agenda for Combating Malnutrition. (WHO/NHD/00.6). Geneva: World Health Organization; 2000. p. 9-21. Available from: http://www.who.int/mip2001/files/2231/NHDprogressreport2000.pdf. [Last accessed on 2009 Aug 25]. National Population Commission (NPC) [Nigeria] and ICF International. Nigeria Demographic and Health Survey 2013. Abuja, Nigeria, Rockville, Maryland, USA; 2014. NPC/ORC Macro. Nigeria Demographic and Health Survey 2003. Calverton, Maryland: National Population Commission and ORC Macro; 2004. Maziya-Dixon B, Akinyele IO, Oguntona EB, Nokoe S, Sanusi RA, Harris E. Nigeria Food Consumption and Nurition Survey 2001-2003 Summary. Ibadan, Nigeria: International Institute of Tropical Agriculture; 2004. Smith LC, Ruel MT, Ndiaye A. Why is child malnutrition lower in urban than rural areas? Evidence from 36 developing countries. World Dev 2005;33:1285-305. Bain LE, Awah PK, Geraldine N, Kindong NP, Sigal Y, Bernard N, et al. Malnutrition in Sub-Saharan Africa: Burden, causes and prospects. Pan Afr Med J 2013;15:120. Ogbo FA, Page A, Idoko J, Claudio F, Agho KE. Trends in complementary feeding indicators in Nigeria, 2003-2013. BMJ Open 2015;5:e008467. Ogunlesi TA, Dedeke IO, Kuponiyi OT. Socio-economic classification of children attending specialist paediatric centres in Ogun state, Nigeria. Niger Med Pract 2008;54:21-5. Frongillo EA. Undertaking challenges of improving complimentary feeding of infants and young children. SCN News 2006;27:41-2. Ugbodaga K. 6 Months Maternity Leave for Female Civil Servants. P.M. News Nigeria; 17 July, 2014. Lawan UM, Amole GT, Jahum MG, Sani A. Age-appropriate feeding practices and nutritional status of infants attending child welfare clinic at a Teaching Hospital in Nigeria. J Fam Community Med 2014;21:6-12. Kulwa KB, Mamiro PS, Kimanya ME, Mziray R, Kolsteren PW. Feeding practices and nutrient content of complementary meals in rural central Tanzania: Implications for dietary adequacy and nutritional status. BMC Pediatr 2015;15:171. Luo R, Shi Y, Zhou H, Yue A, Zhang L, Sylvia S, et al. Anemia and feeding practices among infants in rural Shaanxi Province in China. Nutrients 2014;6:5975-91. World Health Organization. Indicators for assessing infant and young child feeding practices. Geneva, Switzerland: WHO; 2008. Faber M, Benadé AJ. Nutritional status and dietary practices of 4-24-month-old children from a rural South African community. Public Health Nutr 1999;2:179-85. Manios Y, Moschonis G, Grammatikaki E, Mavrogianni C, van den Heuvel EG, Bos R, et al. Food group and micronutrient intake adequacy among children, adults and elderly women in Greece. Nutrients 2015;7:1841-58. Senbanjo IO, Olayiwola IO, Afolabi WA, Senbanjo OC. Maternal and child under-nutrition in rural and urban communities of Lagos state, Nigeria: The relationship and risk factors. BMC Res Notes 2013;6:286.